January 18, 2006 Ducati’s announcement a few weeks ago that the 2006 Paul Smart 1000LE’s entire production run of 2000 units had been made and there would be no more produced, made it clear that the value of each and every one of those machines would continue to appreciate forever more. The Ducati V-twin race heritage is without peer, with 241 World Superbike Championship wins - more than all the other manufacturers combined. But two wins stand above them all – Mike Hailwood’s comeback win at the Isle of Man on June 2, 1978 and the very first V-twin race start, on April 23, 1972 when Paul Smart led a Ducati 1-2 in the Imola 200. The race bike spawned the Ducati 750SS and now three decades later, the VERY limited edition Paul Smart Replica. At US$18,000, it offers a gilt-edged investment that’s faster than the original race bike. The original Imola 1-2 is the stuff of legend and in researching this article, we came across an article written by Smart himself recollecting the lead-up and the race day on One Wheel Drive – it’s well worth a read. Now the moral of this story is that not every motorcycle appreciates in value, but every now and again, there’s one that does, and this one bears all the signs of being a very good long term investment that doesn’t require being locked in a bank vault while it does its appreciating. In 2001, Ducati commemorated Hailwood’s win with a limited edition model designated the MH900e and the prices for which those models change hands now attest to the inevitabilities of the laws of supply and demand when just 2000 motorcycles (the Hailwood Replica was produced in identical quantities) must supply the entire world. Now the PS1000LE is hitting showroom floors around the world, at there are still a few available at US$17,995 in US, in the UK at UKP9,499, and in Australia at AU$23,995. Other national Ducati distributors may have one or two bikes available and our advice is to grab 'em if you can. 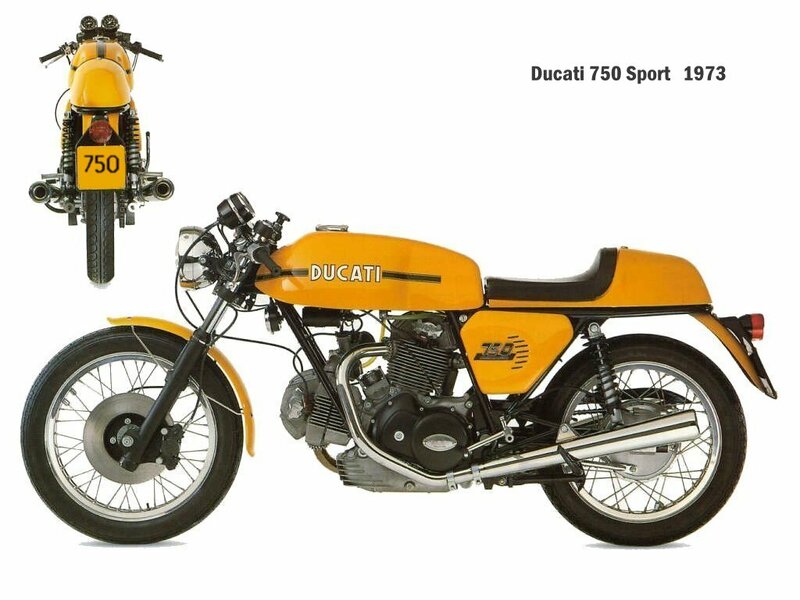 Ducati released its first V-twin, the 750GT, in 1971 and followed it shortly afterwards with the tuned 750 Sport, an unfaired roadster with bright yellow paintwork. 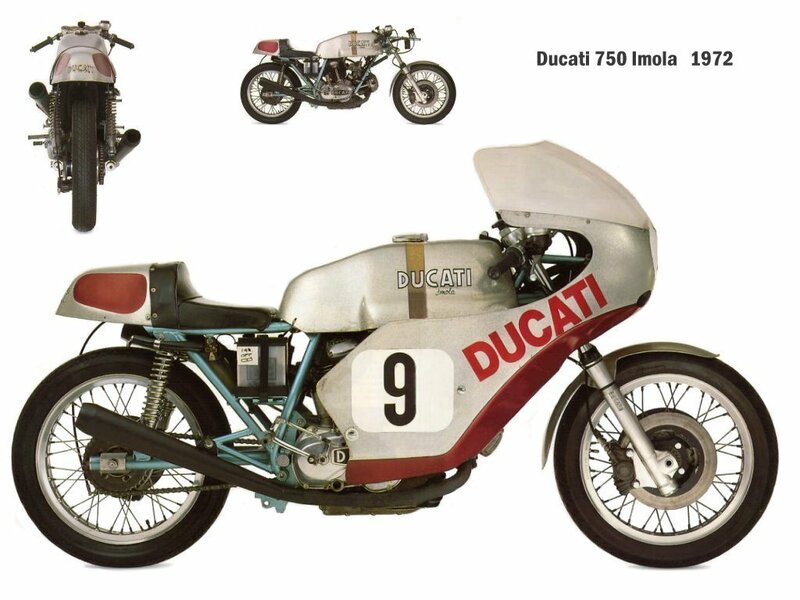 Paul Smart's victory in the 1972 Imola 200 inspired the Bologna firm to build a street-legal replica called the 750SS with desmodromic valve operation like the racer bike. In 1975 the engine was enlarged to 864cc to produce the 900SS, whose maximum of 79bhp and generous mid-range torque gave great acceleration and a top speed of over 130mph (209kph). The 1974 Super Sport 750 is clearly the crown jewel of any classic motorcycle collection. Often referred to as the original Superbike, it was the first Ducati to combine all the performance of Smart’s race bike with a new elegant and trend setting design. The bike boasted beautifully styled components like the “round case” Bevel Drive twin engine, equipped for the first time with Engineer Fabio Taglioni’s Desmodromic valve actuation system. The development of the Ducati Desmodromic system started in the late 50’s and continues to evolve to this day. Every street and racing engine Ducati produces still utilizes the Desmodtromic system. The SuperSport 750 boasted an elegantly styled fairing and bodywork painted in the now famous Metallic Silver colour, complimented by a frame painted in Sea Green. Viewed from any angle the bike always seems in harmony with itself and its street environment. In its day it was “the” ultimate sport bike. After more than thirty years Ducati reintroduces the same essential lines that represent the very essence and pinnacle of beauty in the renaissance of sport motorcycles. The new Ducati Paul Smart 1000 Limited Edition features unmistakeable styling, accentuated by the rounded lines of the fairing and fuel tank. The new exhaust system, in black chromed and sanded stainless steel, has distinctive stacked twin silencers positioned on the right-hand side of the bike. The unique steel tube swingarm is characterized by an elliptical “GP” style right leg, which accommodates the placement of the new exhaust system. The advanced air–cooled Desmo 1000 DS engine delivers the perfect balance of torque and horsepower performance. The exclusive character of the Paul Smart 1000 Limited Edition, of which only 2000 will be produced, is underlined by the use of top-level fully-adjustable Öhlins suspension and by the Metallic Silver fairing and Sea Green frame colours, as on the 1974 Super Sport 750. In researching this article, we came across a myriad of Ducati content on the internet that indicates just how devoted the marque’s followers have become. Of particular worthiness of mention are the wallpapers available here, and the following scans of some of the original brochures and advertising shots which motorcycle enthusiasts of the day will no doubt recall: 750SS brochure, 750SS wallpaper, 750S brochure, 750 GT brochure here and here, 900SS brochure here and here and some great close-ups of the Imola bike here and here. The Paul Smart 1000 Limited Edition takes advantage of the signature Ducati ALS 450 steel tubular trellis frame, specifically engineered to give the bike precise and confident handling. The frame’s high torsional rigidity ensures gratifying, sure-footed road manners even when pushed to the limit. This trellis frame is used on all Ducati motorcycles, but lends itself well to the Sea Green finish of the Paul Smart 1000 Limited Edition linking it by way of colour to the original 1974 Super Sport 750. The bike has a wheelbase of 1425 mm and trail of 103 mm, which is achieved by moving the fork legs forward by 25 mm with respect to the steering axis (front wheel hub offset) and setting fork rake at 24°. The slightly longer wheelbase compared with most Ducati sport bikes (the wheelbase of the Supersport 1000 DS, for example, is 1395mm) accentuates the typical styling of the 1970s, when bikes tended to be longer. The 750 GT, Sport and Super Sport built between 1971 and 1978, for example, had a wheelbase from 1500 to 1530mm. The Paul Smart Replica uses a welded steel tube swingarm with an outer diameter of 60 mm and wall thickness of 2 mm, with an elliptical right arm to accommodate the new exhaust system with stacked twin silencers, and a robust cross-member that joins the elliptical arm with the round one (on the chain side), where the rear shock absorber mount is located. This new swingarm features a simple, rational system for adjusting drive chain tension. The chain is tensioned by tightening the nuts on the plugs on the end of the swingarm on stud-bolts rigidly connected to a sliding element inside the swingarm legs. The rear wheel assembly is tightened by means of an external nut, which acts by locking the sliders inside and outside the legs. The Paul Smart 1000 Limited Edition is fitted both front and rear with fully adjustable Öhlins suspension. At the rear, the suspension stands out with its single shock mounted on the left-hand side, highlighting the new exhaust system with stacked twin silencers on the right-hand side. Not surprisingly, the bike sports classic wire-spoke wheels. The lightweight Excel 17” aluminium alloy rims keep the overall weight of the front wheel assembly down to a minimum. The 36 chromed steel dehydrogenated spokes are equal length and are variable diameter tapering from 5mm at the hub to 4.4 mm at the rim. The technical choice to use 36 spokes keeps un-sprung weight down to a minimum. The wheel hub is made from paint-finished, die-cast aluminium. The front brake system consists of two Brembo floating callipers with 30 and 32 mm diameter pistons which are thermally insulated. The discs are semi-floating with a diameter of 320 mm and thickness of 4 mm. The spoke wheels made it necessary to use this type of calliper, which is more compact on the side facing the wheel. Unlike the majority of top-end braking systems, which use organic pads, the callipers mounted on this new family of motorcycles use sintered pads that ensure high braking performance. The rear brake system consists of a floating single piston Brembo brake calliper and a 245 mm disc. The Paul Smart uses a new black-finish stainless steel exhaust system. The system features distinctive stacked twin silencers on the right-hand side of the bike. The lines and colours of the silencers take their styling cue from the exhausts used on race bikes of the 60’s and 70’s. The Paul Smart Replica and its Sport brethren are the first Ducati models to comply with EURO 3 anti-pollution standards: the lambda probe inside the compensation tube of the two exhaust manifolds combines with two trivalent catalysers housed in the two silencers. The function of the lambda probe is to measure the oxygen in the exhaust gases and then, via the engine control unit, calibrate the mixture ratio during specific engine operating conditions. The two trivalent catalysers oxidise the unburnt hydrocarbons and carbon monoxide, and reduce the nitrogen oxide. The three SportClassics have a new layout for the electrical system, which helps to conceal the wiring while giving users easy access to all the main components of the system. An innovative feature is the use of a Stepper Motor for automatic control of idling speed, as already fitted on the Ducati Multistrada. This method of control ensures perfect adjustment of idling speed in the many varied ambient conditions and after extensive service life. This means that the throttle body can dispense with the cold start mechanism, thus considerably simplifying the system that operates the throttles. The idling regulator has a shutter with a horizontal action driven by a lead screw/nut system connected to an electric stepper motor. It is housed in an aluminium casting with which the by-pass circuit on the throttles is made, by means of rubber hoses. The system is directly controlled by the ECU, which applies special strategies for automatic control of idling speed. The unmistakeable style of the Paul Smart 1000 L.E. is accentuated by the rounded lines of the fairing and fuel tank, the unique shape of the seat, exhaust system and wire wheels. Astride the bike you are immediately aware of the attention to detail: after your eyes settle briefly on the shiny chromed fuel cap, you are soon drawn to the distinctive, polished and anodised steering head. Then you spot the fully polished steering damper with chromed rod fixed to the steering head with an aluminium clamp. A tapered mount on the top crown, and aluminium tubing going side to side supports the fairing assembly. Your gaze then falls on the instrument panel with white instrument faces bearing the classic Ducati logo as used on the fuel tank. The instruments are further embellished by chromed trim rings and control buttons. The minimalist approach of the original Café Racers is embodied in the Sport 1000, which its simple single large headlamp and bar-end chromed mirrors. The yellow, black and red colours, enhanced by the contrasting racing stripes down the centre of the fuel tank and tailpiece, accentuate the eccentricity of this “sport naked” beauty. The bike is characterised by the elegant finishes of polished aluminium, chrome and monochromatic paint. The front end of the bike is characterised by the finishes of the instrument panel and the distinctive top clamp with its two hallmark fork caps in polished, anodised aluminium alloy. The distinctive shape of the seat is emphasised by its double-stitched cover, which accentuates the lines of the seat, and features an embossed Ducati logo. The attention to detail is applied to normally mundane components like foot-peg brackets and foot pegs, gear shifter, rear brake lever and side stand which in the case of the SportClassics are finished in polished aluminium. The 90° twin cylinder itself is embellished with special details such as a chromed clutch and crank shaft timing inspection covers, polished valve covers and black timing belt covers. The rounded shapes of the new tail light and chromed turn signals are also details with strong 1970’s styling. Another elegant reflection on the past is the housing and mounting of the battery. Its moulded plastic case, embossed with the traditional Ducati logo, is enveloped by a steel base “drilled” for lightening, which for battery removal, pivots on two pins on the frame. Compact, powerful and acknowledged as the ultimate expression of the Ducati philosophy of air-cooled twin design, the 1000 Dual Spark Desmo – already used on the Monster, Multistrada and Super Sport families – represents the result of decades of experience and a whole series of innovations that extend from the combustion chambers to the crankshaft. The end result is a powerful engine that is particularly exuberant in the mid-range and generally acknowledged as the most advanced air-cooled L-twin ever designed. In addition to offering the significant advantages of an air-cooled power plant, the 1000 DS also draws inspiration from the advanced Testastretta racing engine, including the special casting techniques used to make the cylinder heads, the use of oil-pressurized plain bearings to support the camshafts, and the angles and configuration of the valves. All this, plus the exclusive Dual Spark ignition, with its "double flame front", offers more complete combustion, while simultaneously boosting mid-range power and reducing emission levels. A closer look at the 1000 DS engine reveals a reduced angle between the intake and exhaust valves, one of the basic principles with which the renowned Testastretta engine was designed, which allows for a more compact combustion chamber, reducing the volume and thus obtaining improved combustion. The improved efficiency of the combustion chamber allows the engine to run on a leaner air/fuel mixture without compromising performance at high temperatures and significantly reduces emissions of hydrocarbons (HC). Finally, both the clutch housing and the clutch plates are now made from a special aluminium alloy. Thanks to this new material, the clutch has a significantly longer service life due to the more balanced wear factor of the alloy. The clutch also now runs quieter due to improved tolerances and the lower resonance value of aluminium compared to steel. Smart's bike - he was allowed to keep the machine. The 750 Sport road bike of 1973.